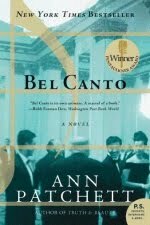 a book chick: "Bel Canto"
my take: My interest in Ann Patchett was piqued this summer when I got around to reading a recommend by someone reading through all her works. I really liked State of Wonder so ventured on to another of her novels. I don't like to give away the plot or tell too much content ... but here's what I thought each night as I climbed into bed and reached for Bel Canto: those people are still there. I loved the use of music and cultures and the new way characters saw themselves and each other. a quiet novel ... not much action ... populated with great characters. Cousin Betsy says The Patron Saint of Liars is the best she's read of Ann, so that's going on the list.